There are many foods that are a nutritious and healthy alternative for your pig. Not all pigs like everything that's good for them. And if given the opportunity, pigs will go for what tastes good and that's not usually the most nutritious option if there is a choice. It's good to give a mixture and soon enough you will find out what your pigs likes and dislikes are and you can change or cater your pigs diet accordingly. They'll need a well balanced diverse diet if the all natural diet is the choice you make with supplements for the ingredients that are essential for overall health. Click here to visit the USDA website regarding the amount of nutrition in different specific foods. http://ndb.nal.usda.gov/ndb/search. You can search for the nutritional content of any food by using that link. ​DIET- ﻿That dreaded four letter word! Everyone is always concerned about feeding their pig too much or too little. For this reason along diet is one of the most discussed topics that there is! If you look into our lives as humans diet is also one of our main focuses as well, so why wouldn't you care about the food that goes into your beloved piggies. When you take you pig to the vet or your vet comes to see your pig, talk to them about everything thats going on including nutrition. If you aren't having a conversation with your vet about what you’re feeding your pig and how much you’re feeding him, you’re missing an important step to preventative health care and also an opportunity to have a professional guide you. Starving your pig vs overfeeding and where is the fine line you ask? Would you feed your child a diet that limits their muscle or bone growth? No way, so why would you do that to your pig? Most mini pig foods are the best suited diet for our pigs. The manufactured mini pig pellets have essentials vitamins and minerals in them that sometimes are difficult to obtain with a natural diet however it can be accomplished. So now that you know the types of mini pig food (see pictures on the left) what do you feed and how much?? Feeding is on an individual preference is the best way to put it. All feeds have positive and negatives and some of the most talked about are Mazuri vs Pig and Sow. Best thing to keep in mind when it comes to our pigs is the fact that YOU know your pig best! No matter which food you pick there is a MINIMUM feeding that you should NEVER go under! Suggested amounts are typically written on the bags of feed themselves. The general rule of thumb is a % of their IDEAL body weight, not how much they currently weigh, but what a pig of their height and length SHOULD way. Every pig is different and needs food catered to their body and physical activity. With that in mind, making sure they have that well balanced diet is key! As I always say "green veggies-GO!" Balance out snack versus meals and keep in mind proportions. Know that fruits, although are tasty, are as high in sugar as starchy vegetables. With that being said, it doesn't mean you can't feed them these foods, just remember it is all about moderation for everything in life! There are body scoring charts listed on our website to help you determine if your pigs body shape is unhealthy or ideal. (Click here to view that page) The ideal number is a solid 3-3+. You shouldn't be able to physically see spine or hip bones and pigs should have a well rounded backside. If you notice your pig is quickly gaining weight, you may need to cut back on the amount you're feeding, if you notice your pig is not gaining weight, you may need to increase the amount you're feeding. How do you know if your pig is unhealthy? We have a page dedicated to that as well! You can click here to learn more about body scoring and ideal body weight. If you feel you need help with an assessment on your pigs size or proper nutrition for your pig as always feel free to email us! We are always here to help! A healthy pig is a happy pig! There are several major pig feed manufacturers and typically those brand-name feed companies feed are fairly comparable to each other, it's more about convenience and preference. I had the privilege of having a conference call with the head nutritionist for Purina pig and sow, and as many of us know Purina does own the Purina products as well as the Mazuri brand pig feed. 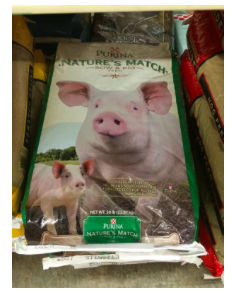 Per the conversation I had with the nutritionist and her colleagues from Purina, Purina does recommend Mazuri mini pig feed for the pet pigs that we have. I'll share a few things that I learned during that conference call, MSG is being removed from the feed beginning March 15, 2015 in addition they are also adding soy oil to the feed due to the ongoing common dry skin problems that the parents have. Something new I learned when I spoke with them, is that the raw ingredients of their feed, is tested on a daily basis and slight changes to their formulary is made on a daily/weekly basis in order to supplement with slight modifications to additives in order to balance the diet. Purina pig and sow is produced for production pigs it is designed to be complete nutrition for these pigs. Mazuri feed, however, is designed for many pigs or pet pigs. The Mazuri diet is formulated to be added to foods that a pig Parent may be given their pet pig such as vegetables treats or fruits. Other well-known pig feed manufacturers are MannaPro and champion brand by Ross mill farms. A lot of people add water to the feed, and thats fine, pigs need hydration, but use warm or cold water versus hot water. Hot water can damage the integrity of the feed and essentially kill off some of the vitamins and nutrients that are added. In addition to the formulated diet, you can feed a good variety of fresh vegetables to make up about 25% of the pig's diet. Foods such as celery, cucumbers, peppers, carrots, potatoes and some greens are good choices (but try to limit the starchy vegetables like potatoes). 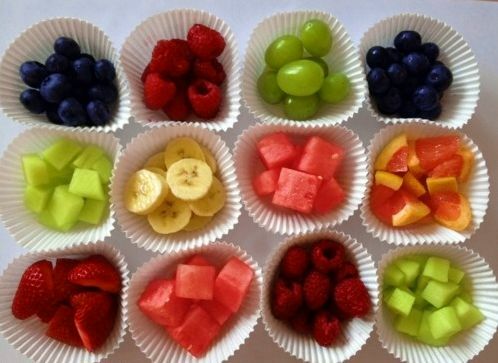 Some fruits can be feed as well but only in moderation due to the high sugar content. Most pigs love treats like apples, grapes and raisins, but these are good to reserve as treats to be used in training. Another option for pig parents is an all natural diet. An all natural diet is a personal choice, but some basic foods need to be included in order to ensure all the vital nutritional components are fulfilled. You can add any of these to a pelleted diet as well. Protein rich foods include: almonds, peanuts, beechnuts, Brazil nuts, butternuts, cashews, flaxseed, hazelnuts, sunflower seeds, pumpkin seeds, pecans, sunflower seeds and walnuts to name a few. Cereal grains like oats, quinoa, brown rice, oat bran, wheat bran, barley, corn and hominy. Beans (cooked, not raw) including kidney beans, Lima beans, navy or pinto beans. 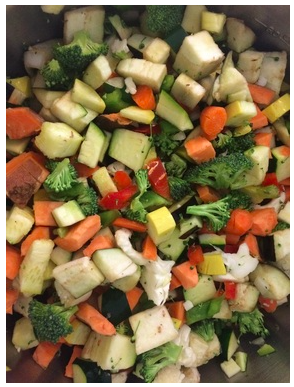 Vegetables can include carrots, broccoli, brussel sprouts, cabbage, celery, cauliflower, lettuce, onions, peas, peppers, corn, eggplant, kale, spinach, squash, zucchini, sweet potatoes and pumpkin. Some vegetables can be fed in larger quantities if they are low in calories; these include cucumbers, celery, lettuce, bell peppers, cabbage, broccoli, and green beans. Pigs find delicious many vege­table parts that we normally throw away. Keep a plastic container in your refrigerator to hold peelings and cores of cabbage, lettuce, apples, melons, tomatoes, eggplant, bell peppers, po­tatoes, squash, and carrots. Feed the starchy vegetables with discretion. 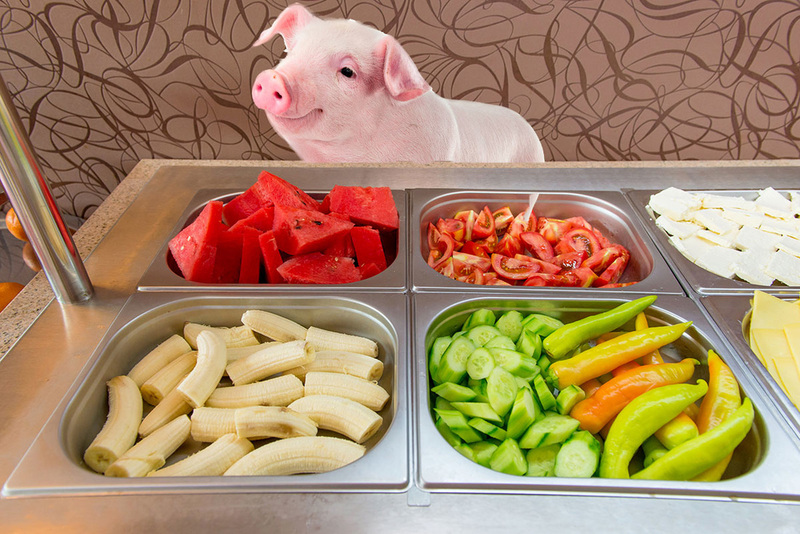 Pigs love banana peels, but do not feed citrus peels. Other fruits and vegetables pigs love are: bananas, peaches, pears, melons, corn (feed sparingly), tomatoes, eggplant, boiled onions, plums, and peeled citrus. Good training treats are apple slices, grapes, raisins, frozen peas, and raw peanuts (in or out of the shell) . Inappropriate things to feed your pig include cat or dog food, meat, alcoholic beverages, chocolatey or salty foods, candy or sugary treats, acorns, dairy products or poisonous plants in your yard or home. 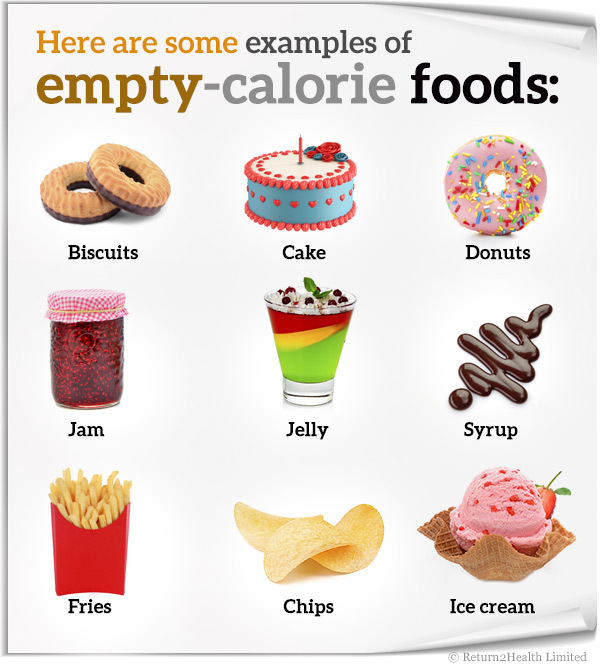 Some foods are quite simply empty calories. No nutritional value at all. One of the most frequently asked questions is which brand of feed is best. I have actually spoke to the head nutritionist at Purina who also owns the Mazuri brand. Champion by Ross Mill Farms is another popular brand as is Manna Pro. Each one of these brands is similar in its make up. Purina was designed to be the only source of nutrition for production pigs, it is not recommended for mini pigs. Mazuri is the recommended feed for mini pigs according to their experts. Mazuri was designed to work in collaboration with fresh fruits and veggies along with treats and is not designed to be the only source of nutrition. Some pig rescues (like Gallastar Therapeutic Riding in Virginia) mill their own feed and sell it as well. Picking a brand is a personal choice, some say the coat of their pig looks better on a particular brand while others have a different opinion. Mazuri is the only brand I am aware of that has different variations for the stages of life, I personally like that. I also like that it's widely available at most feed stores. Some of the others have to be shipped to your home and that can get pricey, but I will say, if you're not having any issues with the brand of feed you're currently using, don't switch it because of someone else experience. Each pig will have a different experience and because someone else has a good result with a particular feed, it doesn't mean you will also. As long as your pigs diet balances their activity level, you are doing good. If you see your pig is gaining a lot of weight, you may want to reconsider the feed or portions/amount being fed. Check out the page dedicated to helping you find that balance by clicking here. Please don't feed your pig dog treats. Dog treats are for dogs. Bones are NEVER an appropriate treat to give a pig. They can splinter or be swallowed whole, both resulting in an emergency for your pig. Some treats designed for other animals are ok to give pigs, but check with your vet to see if he/she has any recommendations before using anything specific. Air popped popcorn (unbuttered and unsalted are fine), peanuts in or out of the shell are ok (unsalted peanuts) PEANUTS ARE THE ONLY NUT THAT IT IS OK TO GIVE IN THE SHELL, DO NOT GIVE OYUR PIG OTHER NUTS IN THE SHELL, THESE SHELLS CAN KILL YOUR PIG! Cheerios are a staple in my home and great to use for training. Most fruits are ok when used sparingly. More specific foods that are appropriate to feed your pig are discussed above in our nutrition section. There have been pigs who were fed dog treats their whole lives and because pigs don't always chew, but swallow things whole, often times damage is done to the esophagus during the digestive process that can lead to abscess formation. This isn't something you would likely notice, but eventually these types of infections can cause irreversible damage and sometimes sepsis and death. It's just not worth it to risk it. You can make coconut oil treats, pumpkin treats, you can give cheerios or peanuts or whatever treat you choose, but please don't feed your pig bones or super hard treats because the damage they do can be invisible until it is too late.